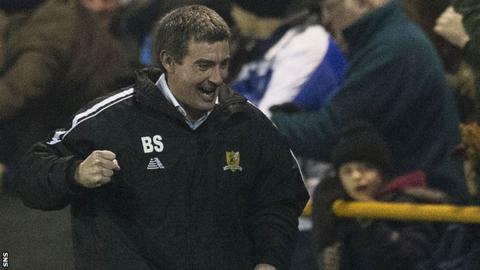 Alloa Athletic manager Barry Smith admits he wants a return to full-time management after being linked with the vacancy at St Mirren. But the 40-year-old says there has been no approach from the Scottish Premiership club for his services. "I don't think there's much else to say because that would be disrespectful to Alloa," said Smith. "The one thing I would say though is that I would like to get back to full-time management one day." "I am employed by Alloa and I'm enjoying being here, but that doesn't mean I don't have aspirations of being a full-time manager,"
Smith stressed that any switch to another club "would have to be done in the correct manner" and would have to come following a formal approach to Alloa. St Mirren, though, are believed to be unwilling to pay compensation for whoever they target as a replacement for Tommy Craig. The 64-year-old was sacked on Tuesday after only 19 matches in charge and with the Buddies second bottom of the Scottish Premiership. Player-coach Gary Teale, who has been put in interim charge, has been quoted as saying he would be interested in the job on a permanent basis, as has team captain Steven Thompson. Former St Mirren midfielder Billy Stark, who recently left his post as Scotland Under-21 manager, is also believed to be interested. Smith, who was born and raised in Paisley, took charge of Alloa in January after Paul Hartley stood down ahead of taking over as manager of Dundee. The part-timers have only won six of their 29 - and one of their last 11 - Championship outings under Smith and sit second bottom of the table, a point ahead of Cowdenbeath. However, Smith's profile has been raised by this month's 3-2 win over Rangers in Petrofac Training Cup, which followed two league draws against the Ibrox club earlier in the season. He previously led Dundee to Scotland's top flight during a three-year stint in charge at Dens Park but was sacked the next season with his side 15 points adrift at the foot of the table. Smith would face another fight for survival should he switch to St Mirren. "I am employed by Alloa and I'm enjoying being here, but that doesn't mean I don't have aspirations of being a full-time manager," added the former Celtic, Dundee, Valur, Partick Thistle and Greenock Morton defender. "The majority of young, part-time managers would like to be full-time and I'm no different to anyone else. "But there is no decision to be made right now because I'm fully focused on Alloa." Alloa chairman Mike Mulranney confirmed to BBC Scotland that no approach had been made for Smith's services while stressing that the Clackmannanshire club would never stand in the way of a player or manager who got the chance to go full-time.